Binary Scam Alerts » Binary Robot 365,Scam Reviews » Binary Robot 365 Review, Deceptive SCAM Exposed! 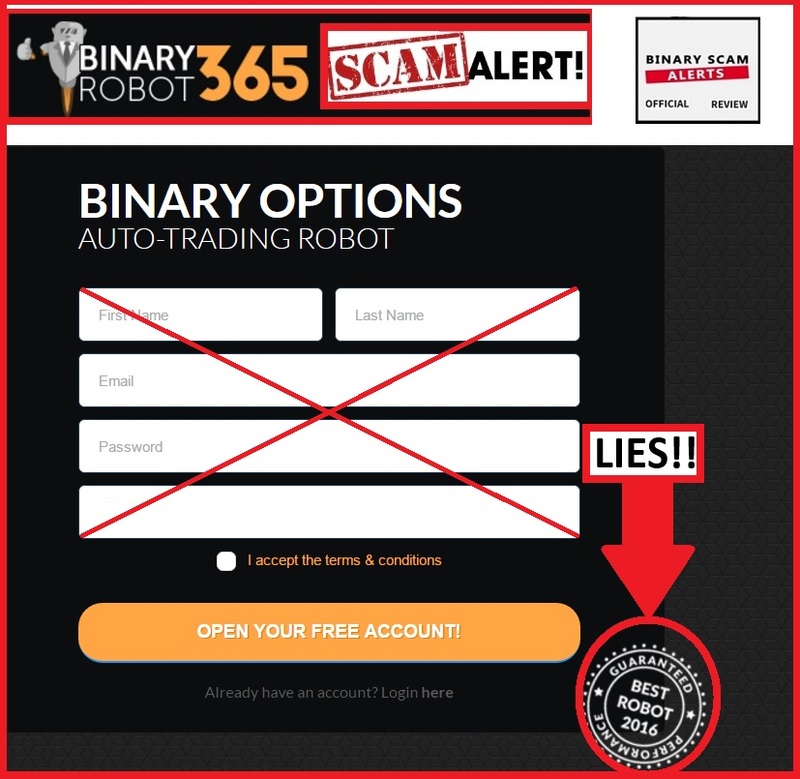 Binary Robot 365 is a BLACKLISTED SCAM software and we will expose this fake trading robot in our new and updated review and investigation. A word of caution, this type of auto-trader is very deceptive since it projects an image of sincerity and legitimacy. At face value everything checks out. The advertised win rates are reasonable, even too low at times. We don’t see much hype, the look and feel seems to be very professional and on point, but this is exactly the reason why we believe Binary Robot 365 to be so dangerous. It’s extremely misleading, deceptive, and very effective and baiting people. So far it has managed to slip under the radar and cause a lot of misery and grief for unsuspecting day traders. However, once we expose these affiliate con artists and shed light on their misdoings we believe their ability to ruin people’s lives will be significantly diminished. Keep reading to see how we caught these crooks red handed and why Binary Robot 365 is a nasty financial scam. Update: We were recently asked to endorse this robot. We refused to to so and now it seems we were correct in our initial conclusion. Don’t fall for this scam, you will end up losing your money. Just read the comments our members left at the bottom to gain a better understanding of what you are getting into. Proof of SCAM – Fake Testimonials and Lies? Below you will see a screenshot of the testimonials page inside the Robot 365 website. It’s very plain to see these con artists have stolen or rehashed existing images taken from older scams like person profits and million dollar months. In the registration section of the software you will see a fake certification that says “Best Robot 2016, Guaranteed Performance”. Truthfully, it’s most likely one of the worst robots and these thieves can’t guarantee anything. In fact, the really honest systems specifically state that trading is risky, or have a clause that says your capital is at risk. It’s exactly this type of disclaimer we are looking for since it is both realistic as well as fair. It’s fair to say that this fake app had great potential but since it resorted to using the all too-well-known scam tactics as other bogus systems use it failed our credibility tests almost immediately. They did do one thing right, the site is HTTPS secure, which is not something others do. However, that is very much similar to the proverbial fig leaf covering something innocuous. They are also transparent about the brokers, which is a good thing, but what we do miss here is a real person saying he is behind it and endorsing it. We had high expectations for this auto-trader, but we were eventually forced to face the harsh reality of dealing with another fraudulent software. Additionally, we are of the opinion that the “top 10 users” section is a kind of script running on a loop, and that is because none of the profiles contain images of real people. We do like the explanatory aspects of the software and they way you can choose a strategy, but this tactic is used to veil the insidiousness of this bogus app and it does it with great success. The various features explaining stop-loss and the way the offer is presented is extremely professional, and if they had paid more attention to the details they could have actually succeeded in peddling their trash code on the internet. Fortunately we are on to these scam artists and finally our members can actually see what this software is really about. In reality, what we are witnessing is a very sophisticated SCAM. While we don’t see the inflated bank accounts and hyped up claims, we do see fake testimonials and forged certifications. No, it is not free and get ready to part with at least $250 which will be charged to your credit card via one of their brokers. We are very much familiar with these types of scams and our review always looks at the good as well as negative aspects of the product which is offered. When you encounter something that looks very polished and clean, chances are it’s not real. Our experience tells us this type of product is able to trick more sophisticated viewers. So stay alert and be careful. The ones topping the charts these days are Tesler App and Blazing Trader. If you are having trouble making a decision about which is better for you, join the club. Fortunately, we have tested most of the systems available today for you. These are all proudly displayed in our recommended section. Binary Robot 365 is a SCAM and we rightfully blacklisted it in our honest and factual review. We have just now received more complaints about SPAM emails and various advertisements popping up very aggressively. So, if you believe this system to be legit or genuine you are deeply mistaken and hopefully you will realize this before all your money is stolen by unlicensed brokers and thieving affiliate marketers. We also know now these are the same people who are behind Signals 365, which is a fake signals app. In light of all the evidence, proof, and findings our staff of researchers has produced, we have no choice but to blacklist this fake trading app and advise our members and subscribers to seek alternative investment avenues. We are also available through our Facebook Group and YouTube Channel and answer a lot of questions there so please join and get informed.